WASHINGTON, D.C.––At the founding meeting of the Organization of African Unity (OAU) in Addis Ababa, Ethiopia on May 25, 1963, a resolution was passed establishing May 25th as African Liberation Day. On the eve of the resolution––May 24, 1963––Kwame Nkrumah, President of Ghana, gave one of the most powerful and prophetic speeches to 31 heads of states of African countries. “On this continent, it has not taken us long to discover that the struggle against colonialism does not end with the attainment of national independence. Nkrumah “knew that he would lose the vote to create the Union of African States that he envisioned” and every warning in his speech has come to life. So we must not look at the founding of African Liberation Day as a monumental event for our people because, in fact, the Organization of African Unity (now the African Union) cemented neocolonial rule and the abhorrent condition throughout Africa today. The first ALD mobilization in the U.S. was held on May 27, 1972 and was called to support the various liberation struggles that were still being fought in Africa, particularly in Southern Africa, from Mozambique to Occupied Azania (South Africa). In fact, Chairman Omali Yeshitela of the African People’s Socialist Party, was on the first ALD Organizing Committee. Since then, many have celebrated African Liberation Day throughout the African world, but ALD has always been a celebration of the founding of our glorious Party. Our Party maintains that the day must be tied to continuing our struggle for liberation. “Our Party has the benefit of a 45-year-old history of genuine revolutionary struggle, through which we have acquired experience and an unmatched level of political maturity. “We have taken Nkrumah’s words of a united Africa; but, instead of insisting that neocolonial forces betray their class interest, we put the task of African Liberation squarely in the hands of the African working class. “This is not just a celebration of the many victories of our Party, but in the era of continuous war and general imperialist crisis, a symbol that we will continue to blaze the path forward for African Liberation. “We have developed political clarity by waging ideological campaigns within our own Party and in the world, testing our worldview while making the most serious assault on our colonialist capitalist oppressors. 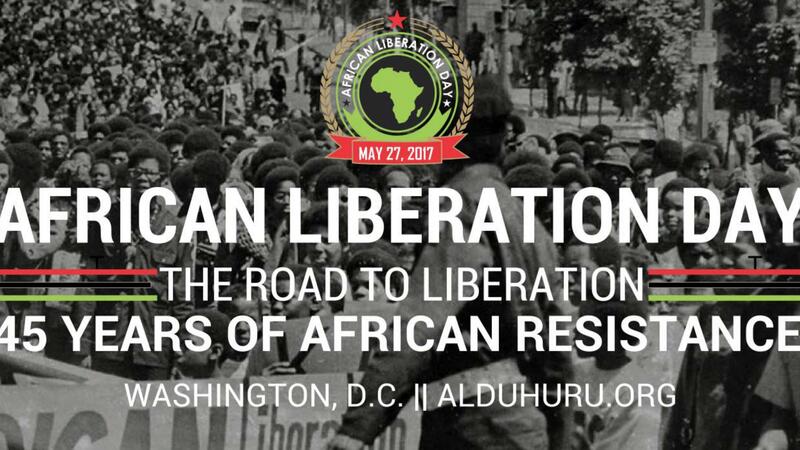 On African Liberation Day on May 27, 2017 in Washington D.C., we will proudly proclaim leadership of the African struggle against colonialism. We want to ensure that all attendees have the ability to be involved in the revolution. African Liberation Day 2017 will begin at 10 a.m. with a march through the oppressed working class community in Anacostia. We then will convene our African Liberation Day program at the historic Union Temple Baptist Church in Southeast, Washington, DC at 11 a.m.
We will have panel discussions on “What the Trump Agenda Means for Africa and Africans?” led by our Chairman. ALD 2017 will highlight our Party’s history of injecting revolution to the mass line of our people and will feature presentation from Kalonda Mulamba, the Editor in Chief of The Burning Spear newspaper, the longest running African revolutionary newspaper in the world, as well as Managers of Black Power 96.3 FM, a revolutionary radio station based in St. Petersburg, FL that can be streamed online around the world. We have assembled a powerful panel, “Protect Our Black Girls” to discuss the fight for justice of the three drowned black girls who were chased by Pinellas County Florida Sheriffs into a pond and drowned while deputies watched. We will hear from President of the African National Women’s Organization, Yejide Orunmila, about the #ArrestDHS campaign and the missing black girls in Washington, D.C.
Then we will hear from mothers themselves who have had their children stolen by Department of Human Services (DHS). In addition to our extraordinary panel discussions, we will have vendors, food and progressive cultural performances throughout the day. We expect participants throughout the African world to join us on this historic day. ALD events will also be held by the Bahamas Front of our Party on May 27th so that Africans in the Caribbean. Africans in Europe can participate in African Liberation Day in Paris, France on June 3rd. Join us in celebrating our magnificent Party and 45 years of paving the road to liberation! Register today at alduhuru.org. To join our committee and find out more information, email us at [email protected] or call 202.642.4672. Forward to African Liberation Day! Long Live the African People’s Socialist Party! African liberation, now more than ever!